"Vaiyasaki Das's kirtan music is imported from the spiritual world. His voice is a gift from the gods, a blessing from Lord Krishna. When one hears his otherworldly vocals, the heart opens and the mind becomes soothed. He transports listeners to a divine realm, wherein every word is a song and every step is a dance. Making use of prodigious recording skills and his innate musical talents, his CDs reflect this spiritual phenomenon, enabling listeners to experience sonic bliss." -Swami Rama - Himalayan Institute. "Few chant leaders of today have the vocal range and flexibility of Vaiyasaki Das. A kirtan extraordinaire, Vaiyasaki Das’ music evokes the ancient and timeless experience of chanting and carries you to soul of India. With a powerful combination of classical vocals, traditional instrumentation, and bhav (devotion), Vaiyasaki delivers an unmistakable presence to his music. In short, his bhajans and kirtan capture the mind and heart. It is really a pleasure to listen to Vaiyasaki Das' sacred music. These powerful vibrations enter deep within each of our cells and open our hearts to unconditional love. -Márcia DeLuca, Ciymam - São Paulo Brazil. "Thank you so much, master kirtan-kara Sri Vaiyasaki Das for giving us the ladder of melodies to climb to the songs of the stars..."
-Swami Veda Bharati. Rishikesh, India. "Vaiyasaki Das' voice, his interpretation of mantras, and his impressive ability to play harmonium touches deep within our heart. His chanting gives peace to the mind, allowing us to connect with our soul, our true self." Haribol! Welcome to my updated website.  At this site you will find an excellent source of information about kirtan, or the call-and-response chanting of the Divine Names of God. I have produced many Kirtan & Bhajan CD's over the years. They include traditional Bengali bhajans, mantras, ragas, and numerous Krishna Kirtan melodies. I've been traveling the world presenting Kirtan Rasa in the tradition of Sri Chaitanya Mahaprabhu. I am an initiated disciple of His Divine Grace A.C. Bhaktivedanta Swami who introduced Krishna Kirtan to the western world in 1965 in New York City. During the next 12 years he circled the globe introducing Kirtan and Vedic culture in fulfillment of an ancient prophesy that Krishna Kirtan would spread to every town and village of the world. By His grace I have dedicated the last 40 years of my life to this sacred tradition. My wife, Kaisori, and I spend 6 months of the year touring all over India and Asia doing Kirtan events, and giving discourses on Bhakti-yoga. The other 6 months we are usually on tour throughout many European countries, and the Americas. You can also catch me on tour in your area. SRI KRISHNA DIVYA NAM reveals yet another side of kirtan extraordinaire Vaiyasaki Das’s high caliber as a devotional singer. At the peak of his accomplished musicianship and devotion, Vaiyasaki Das sings these kirtan songs in elegant mystical ragas that opens and soothes the heart chakra. With a powerful combination of classical vocals, traditional instrumentation, and sweet bhava, Vaiyasaki Das delivers an unmistakable presence to his music. The emotions of sweetness and love intertwined with celestial sounds and the sophistication of instruments like santoor, flute, and esraj, bring the listener to the opening of the heart to the door of divine love. ‘Sindura,’ ‘Shiva Ranjani’ and ‘Sri Krishna Divya Nam’ are soulful and powerful taking you to mystic India, while ‘Bhatialli’ and ‘Lalon Giti’ take you to the soul of Bengal. Each song in this CD is imbued with love. A couple of songs feature the angelic female vocals of Krishna Prestaya. Once again, Vaiyasaki Das has delivered a hit! “KIRTAN EXPLOSION – High energy kirtans.” is a tidal wave of divine love filled with heart evoking emotions and joy. This new live CD from Vaiyasaki Das was recorded in Slovenia with 300 enthusiastic devotees immersed in the ecstasy of chanting the divine names. After the great success and demand of his two previous live albums Kirtan Rasa and Hari-Nam-Ananda, Kirtan Explosion by Vaiyasaki Das comes with renewed shakti, bringing the listener to a wonderful explosion of love. The songs include mantras like ‘Govinda Jaya Jaya,’ ‘Radha-Ramana Haribol,’ and ‘Namaste Sri Radhe’ among other kirtans. This CD not only captures the spirit of the live concert, but the recording quality is superb -a truly devotional live recording of spiritual voices raised in song. Kirtan Explosion is a must-have for your spiritual music collection. RATHA-YATRA USA – His Divine Grace A. C. Bhaktivedanta Swami Prabhupada first brought the glories of Lord Jagannath to the western world in 1967 to benefit humanity at large. He introduced annual Ratha-Yatra Festivals in the most important cities of the world. The Vedas declare that those who pull Jagannath’s chariot become free from rebirth. This album by Vaiyasaki Das was recorded live at various Ratha-Yatra Festivals in the USA. The Kirtans bring the listener to the Festival Site to experience the ecstasy of Jagannath’s mercy. The Kirtans glorify the Lord with esraj, sarod, mrdanga, kartals, tambourine and kazoo. Although recorded in America the kirtans retain traditional Bengali roots with Vaiyasaki Das’s signature Kirtan style. The drumming is outstanding by expert American and Bengali players. Radha-Madhava and Prem-Nam Kirtan are simply beautiful, and Bhagesri Kirtan Parts 1 & 2 feature Vaiyasaki Das’s amazing troop of Bengali musicians. This festive album transports the listener to Ratha-Yatra through the potent sound vibration of the mantras and high-spirited mood of the kirtans. Ratha-Yatra USA carries Jagannatha Swami’s grace and gives joy to the heart. 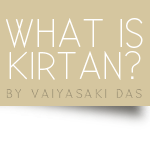 Vaiyasaki Das is among my favorite kirtaniyas, and he is a credit to the kirtan movement today -- a precious gem that shines brightly even in the midst of glistening jewels. His story is retold in my book, The Yoga of Kirtan (www.yogaofkirtan.com), and readers are advised to peruse those pages to learn his personal history, to see how his natural talents were polished, again, like a fine gem, by his spiritual teacher and by the process of Bhakti-yoga, how his taste for kirtan developed and how his heart was thereby cleansed. His numerous CDs are seminal for anyone trying to enter into the moods and feelings of kirtan, and this author recommends his work above all others. With such high praise as a preface to this review, let it be said that his latest CD may be his best one yet: "Sri Krishna Divya Nam" literally means, "The Transcendental Name of Lord Krishna" -- and this CD indeed brings listeners straight into the magic and life of Krishna's Name. Over five years in the making, this work is, in many ways, the culmination of all Vaiyasaki has done thus far. The disk opens with an enthusiastic devotional song in the ancient tongue of Kannada, from South India. The tune was written by Purandara Das, a sixteenth-century saint/songwriter widely renowned as "the father of Carnatic music." On Vaiyasaki's version, he is assisted by Krishna Presthaya, who sings complementary verse in call-and-response fashion. Her angelic voice offsets his own, creating an otherworldly dynamic that transports one to the spiritual world. Vaiyasaki breaks up Purandara's traditional song with the additional chanting of "sri krishna divya nam" because of the tune's central message: "Whatever you're doing, day or night, during your life or at the time of death -- nothing can save you except taking shelter of Krishna's Name." Songs Two and Three are interrelated. This is the Maha-mantra on the most esoteric level, its inner meaning -- the eight stages of divine love -- exposed through a specific combination of notes and moods. The melodies are expressive of both union and separation -- they depict how one feels when connected to Krishna by His warm embrace of love, and then the heart-rending emotion of parting, of being pulled away from that, or from whom, sustains one's life. This magnetic to-and-fro pulling and its concomitant (and inevitable) ultimate union with Krishna is fully conveyed in these songs. The sense of love and longing is palpable. Track Four, Bhatialli kirtan, is a popular Bengali melody, and of such melodies Vaiyasaki is clearly a master. He is expert in numerous forms of kirtan, making good use of his knowledge of languages and dialects, of moods and nuance. But his special love is Bengali kirtan, and that is evident from this song. In the mood of Narottama Das Thakur's Garan-hati style of kirtan, it begins slowly and gradually picks up, increasing the bhava and allowing the mantra to engulf one's heart -- more and more intense as the rhythm speeds up. Towards the end of the track, Vaiyasaki hits higher and higher notes, culminating in one amazing note that has to be heard to be believed: The high point of the song has been reached -- the listener is almost forcibly brought into the emotion and tenor of ecstatic chant!! Track Five, Giti Kirtan, shares with us the life and work of Lalon Shah (c.1774–1890), a much loved Bengali philosopher/ poet. He lived in the village of Cheuria in the area known as Nodia in the Bengal Presidency of British India, corresponding to the district of Kushtia in present-day Bangladesh. His kirtan poetry is so revered that he is claimed by all religious groups and denominations in spiritual India: Muslims and Hindus, Sufis and bhaktas. Everyone wants him as their own. But, in my opinion, Vaiyasaki wins the battle. His sensitive portrayal of Lalon's mood and emotion is overwhelming, making the lyrical poet his own in every way. Priya Kirtan is Track Six, the penultimate song on this CD masterpiece. Focusing on the Maha-mantra, this tune is rendered in the style of a Gaan, a form of musical expression that is particularly popular in Bangladesh. When cultured Bengali listeners hear these types of kirtan melodies, they immediately recognize the theme and the moods evoked by the song. For Western listeners who are not accustomed to these techniques and to this "science of melodies," however, their lack of familiarity matters little: the beauty and passion still comes through, and the heart responds to the tune in any case. Truth is truth and beauty is beauty, and one need not be educated in the particulars of Bengali music to appreciate it, at least on the most basic level. The final track is the Gambhira lila of Sri Chaitanya. This depicts those precious moments when the saint/avatara Chaitanya Mahaprabhu confined himself to the garden house of Kashi Mishra -- he was experiencing the highest states of ecstatic love and lost all sense of the external world. So intense was his ecstasy, that he would cry unstoppable tears of longing and consistently lapse into states of altered consciousness, his body uncontrollably faltering under the pressure of divine emotion. The raga is Jai Jayanti and the bhava is vipralambha, or the mood of separation. The style is Alap with no rhythm. This song reveals the heart of Lord Chaitanya, or Radharani, crying in a mood of inconsolable separation from Krishna. Vaiyasaki expresses this in his own inimitable way, gently carrying his listeners into the complex and yet simultaneously simple realms of profound spiritual love. Again, this is perhaps Vaiyasaki's finest work, and anyone who loves kirtan should immediately purchase a copy. Indeed, while money certainly can't buy love, it can definitely purchase a CD -- and if any CD can buy you love, this one is it!! © 1999-2010 Narada Muni Music/Per Sinclair. All Rights Reserved.